A migrant, traveling with a caravan of thousands from Central America en route to the United States, walks along the highway to Juchitan from Santiago Niltepec, Mexico, Oct. 30, 2018. An impoverished Mexican town nearly flattened by a 2017 earthquake welcomed thousands of tired and hungry Central Americans in a U.S.-bound caravan this week in quiet defiance of U.S. President Donald Trump's condemnation of the group. "We wish we had a space dignified enough to offer our visitors," said Zelfareli Cruz Medina, Niltepec's mayor. 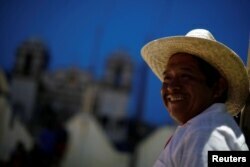 Cruz Gomes, a 44-year-old migrant from Guatemala, part of a caravan of thousands from Central America en route to the United States, smiles while rests in Santiago Niltepec, Mexico, Oct. 29, 2018. As she spoke, caravan members were stringing up garbage bags to use as tents in Niltepec's main square. Surrounding buildings were scarred with cracks and gaping holes caused by the 8.2 magnitude earthquake that struck the region on Sept. 7, 2017. A tower atop Niltepec's main church was stripped down to its fragile wood skeleton by the quake and Cruz said the town needed help to rebuild its library and the mayor's offices, which were serving as a shelter for the caravan's women and children. But a willingness to help the needy comes as almost second-nature to residents of the hardscrabble town in Oaxaca, one of Mexico's poorest states, Cruz said. "We know now what it means to suffer," she said. Later Monday evening, Mariela Escobar, 52, a part-time cleaner, pored over a vat of fuming tamales - "hundreds of them," she said - to hand out free for dinner. "People helped us greatly," said her neighbor, Angela Moreno Galves, 81. "So now, of course, we want to help too." 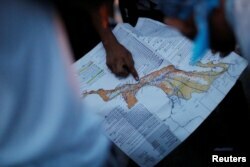 A migrant, part of a caravan of thousands traveling from Central America en route to the United States, points at a map while rest in Santiago Niltepec, Mexico, Oct. 29, 2018. Setting out from Honduras on Oct. 13, the caravan quickly swelled to number several thousand people. The latest estimates put its size at 3,500 to more than double that - matching or exceeding Niltepec's population of 3,800. The warmth of the welcome in Niltepec stood in deliberate, stark contrast to Trump's hostility, said Jorge Luis Fuentes, a senior town official. "It's a form of struggle," he said. "It's a way to demonstrate that rights are universal."